for those of you who don't know, Scandinavian cultures celebrate what is known as Midsommar, which (as you can guess from the word) is the midpoint of the summer. basically, it's the longest day of the year. in 2008, it is today, Saturday, June 21.
in Northern Europe--particularly Scandinavia--Midsommar is celebrated as a major event, marked as a national holiday and with everyone going to festivals in the outdoors. it's made into a grand party, equal parts traditional and modern. you'll see people dressed in old-fashioned folk clothing and performing ancient customs, but you'll also see rock concerts and park picnics. the origins of Midsommar are somewhat arcane. the holiday predates the arrival of Christianity, and so is arguably tied with pagan beliefs. of course, in the modern era, much of the pagan past has been forgotten, and Midsommar is usually now just an excuse to take a day off and have a really good time--a really really really really good time. 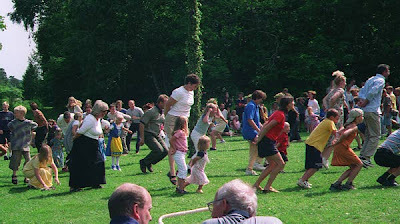 one of the traditions that is faithfully preserved is the Maypole dance (yes, there really is a Maypole dance). 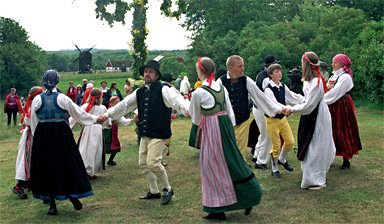 in Sweden, the Maypole dance is done in conjunction with the singing of Små Grodorna, which everyone affectionately refers to as the "frog song" (små grodorna literally translates as "small frog"). any one who has ever lived for any length of time in Sweden will know this song. it's a song taught to all Swedish children, and performed without fail at every Midsommar Maypole dance. it's a part of every Swede's fond memories of childhood. every Swede knows it. every Swede...you are not Swedish if you don't know this song. adults, kids, dogs, cats, birds, bees, flowers, trees, everyone and anyone can sing this song and do the dance that goes with it. if you visit Sweden, or ask any Swede, you'll notice the funniest thing happen: even as much as this song is a part of their childhood, they'll still perform this song--and the accompanying dance--freely and with absolute abandon, making complete and utter juvenile fools of themselves in complete contradiction to the image of the stoic icy frigid demeanor associated with Scandinavians. you'll find that adult Swedes are just as crazy as the child Swedes...in some ways, even more so. i don't really see myself as a Swede in terms of nationality anymore--i never really did; my family left Sweden when i was 7, and i was too young to think about things like national identity or citizenship then. but i do hold a supreme affection for my childhood there, since it is filled with many warm memories. and i remember vividly Midsommar, and singing and dancing with all the other children and adults around the Maypole in unison to Små Grodorna. no, this has nothing to do with triathlon. but it does have something to do with me. and i just wanted to share a very special day.